Slot machines offer a lot of fun moments that make you enjoy the gameplay while earning some money. Learn where these casino games came from. As not to offend those in the southern hemisphere, your can learn about free pokies for New Zealand players in this link. 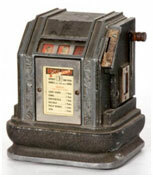 The first slot machines are said to be created in the late 1800’s. There were no money payouts but the winnings were paid to the player as drinks such as beer, food and different items. The payouts were almost non-existent because there were no regulations to guarantee the reasonability and fairness of the games. The first slot machine is said to be created by Charles Fey in San Fransisco. He created also a slot machine that had automatic payouts. Mr. Fey was the first one to think of replacing the card symbols with other symbols such as diamonds, hearts, horseshoes, spades, and a cracked liberty bell. Mr. Fey replaced five reels with three and made the automatic payouts possible. Shortly after the development of the Liberty Bell slot, there were copiers. One of the developments was the today well-known fruit slot machine. These machines were giving out chewing gum instead of money prices. The today’s slot machines are said to be based on a machine developed later in New York. This machine was developed by Sittman and Pitt based on a popular poker game. Slot machines. The symbols of the reels where the playing cards and it had five reels that each had 10 symbols on them. After inserting a coin, a nickel at the time, they had to just pull the lever and hope for a good hand to stop on the reels. In the mid 1990s the slot machines were able to accept also bills. Players no longer needed to change their money to coins in order to play. New features and new games kept coming over the years growing the business. Today slot games are available in different forms and sizes. Players are able to play not only on their computers but on their phones too. The games actually payout real money process and the themes are very innovative. Symbols vary according to the theme and nowadays the slots are covered with animations and exiting features such as bonus games and symbols like wild and scatter which add special characteristics to the games. Nowadays players don’t only play for fun, but to win some extra cash. Playing for real money is even more exhilarating. Try some of the amazing slot machines of today and win the biggest jackpots!